Proin accumsan urna in mi. Aenean elementum egestas tortor. Donec neque magna, auctor a, dapibus sit amet, facilisis sit amet, ligula.. 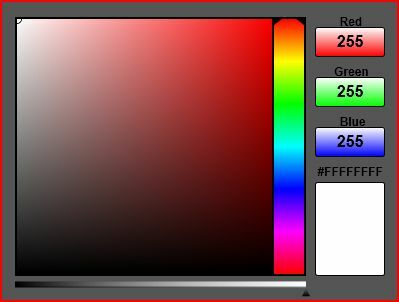 So the other day somebody told me that when they used flash, there was a flash version of the color picker that you could use to let users pick their own color palet. I thought that would be a good idea to implement, so went searching for one done in Silverlight. I saw one that you could use… but it wasn’t as easy or pretty as I wanted. Now I’m not a designer, so when I say pretty, I usually have pretty low standards. Anyway, I threw this little sample together where I took the design of the blend color picker and implemented it in Silverlight. I’m not doing any true color sampling here, just doing the math to determine which color was chosen. Take a look, and if anybody can improve on it, or use it, then feel free. The running sample is here. This entry was posted on Monday, August 20th, 2007 at 10:14 am	and is filed under Silverlight. You can follow any responses to this entry through the RSS 2.0 feed. Both comments and pings are currently closed.